First viewed: May, 2005, with daughter Lorin. This theme is very close to my heart as I have always been fascinated by astronomy, the planets, the vast universe. I used to teach astronomy lessons to my daughter’s classes in elementary school to help students grasp the incredible miracle of the universe God created. As I first viewed Vermeer’s painting in 2005, I felt that he had the same fascination with this subject; even though the knowledge of the universe was so limited in the 1600’s. Although Vermeer’s astronomer and the tapestry on the table are painted with the typical lapis lazuli of Vermeer’s palette, the colors in the painting were not what first drew my eye. Instead, my eye was drawn directly to the profile of the astronomer as well as the placement of his right hand on the globe which is illuminated by the light streaming in from the window. As he studies during the daytime (as opposed to viewing the night skies with technical instruments) it appears that the scholar is comparing what he is reading on a celestial chart with a celestial globe, which shows the apparent positions of the stars and constellations in the sky. The celestial globe of Vermeer’s day, made by Jodocus Hondius, shows the mirror image or the view of the sky from the outside ( whereas, modern celestial globes are transparent so the view is of the inside of the celestial sphere, as it is from Earth) . According to an astronomy expert, the book on the desk is On the Investigation of the Stars by Adriaen Metius, also a famous maker of celestial globes. There is also a flat astrolabe on the table behind the rug which was essential for navigation. Navigational reading had been very common in Dutch life for decades as they were leaders of maritime trade so this probably did not seem so uncommon of a theme in paintings (77). The idea of science was just emerging in the 17th century and was in direct competition with philosophical and religious truths. This is evident in the Dutch paintings of this time, including The Astronomer, which coincided with several astronomical discoveries around the world: King Louis XIV building an observatory in Paris in 1667-72 (near Val-de-Grace where I attended Grammaire classes), Isaac Newton perfecting the reflecting telescope in 1668 and Christian Huygens discovery of the sixth of Saturn’s rings. While researching The Astronomer, Norbert Schneider’s work on Vermeer brought to my attention a major theme which I had overlooked in my first viewing of the painting: the picture hanging in the back of the room is of Moses being rescued from the Nile River. The constellation which appeared in the night sky at the time of this story is depicted on the celestial globe. Ursa Major is visible on the left, Hercules and Draco the Dragon at the center and Lyra on the right. 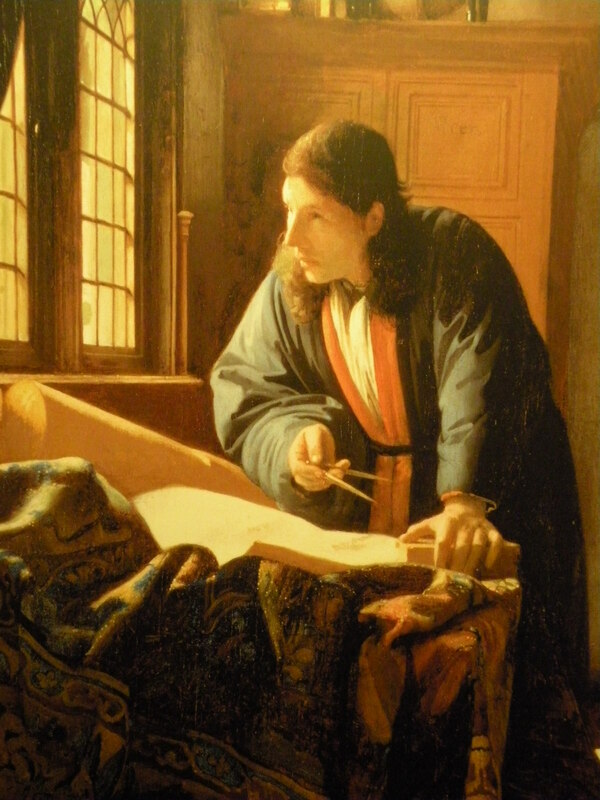 Schneider suggests that Vermeer shows God’s kingdom of the spirit world. The Astronomer’s reaching hand symbolizes his search for a spiritual guide for his own light. In contrast, his sister painting The Geographer, Vermeer shows Gods plans for humankind on the Earth (77). It appears that Vermeer was tying together the religious truth with the scientific truth. 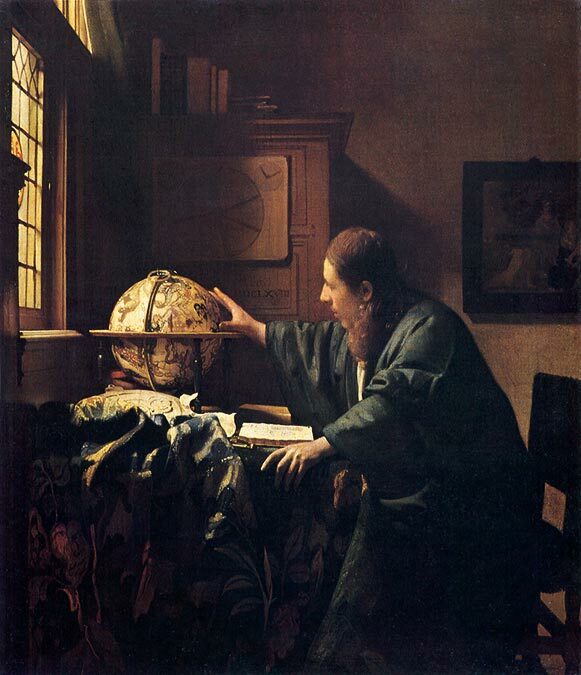 In Vermeer’s Geographer and Astronomer, Antonini states, “ the sense of mystery and an eagerness for research are depicted through the effects of light that envelops the scholars and elevates their pursuits to the realm of the spiritual (136).